Went peacock bass fishing with Capt. 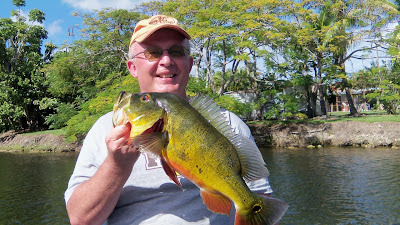 Frank Carbone from www.hawghunterguideservice.com on Nov 28th near the Miami airport. We caught 3 peacocks , largest was 5-6 pounds, 1 largemouth , 1 gar and 1 other fish. Had a great time with Frank. Peacock bass fishing , Cinaruco River fishing , Cinaruco River peacock bass fishing . Welcome to lagunalargalodge.net for enjoying one of the most consistent and exciting experience of your life by Cinaruco river Peacock Bass Fishing by our experts. For slower fishing, and when letting our fly dip under shad schools, I get a kick out of the chance to run with a shinier and more dynamic streamer like this sparkly clouser-style streamer.